Do you live in Sebring? Sebring is a city in Highlands County, Florida, United States, nicknamed "The City on the Circle", in reference to Circle Drive, the center of the Sebring Downtown Historic District. In 2010, the United States Census Bureau reported a population of 10,491. It is the county seat of Highlands County, and is the principal city of the Sebring Micropolitan area. Sebring is the home of the Sebring International Raceway, created on a former airbase, first used in 1950. It hosted the 1959 Formula One United States Grand Prix, but is currently best known as the host of the 12 Hours of Sebring, an annual TUDOR United SportsCar Championship race. Nearby Highlands Hammock State Park is a popular attraction. Additionally, the house where novelist Rex Beach committed suicide is located on one of Sebring's main lakes, Lake Jackson. 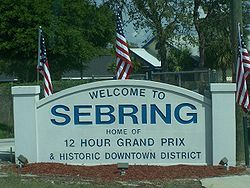 Sebring was founded in 1912. It was named after George E. Sebring, a pottery manufacturer from Ohio who developed the city. The village of Sebring, Ohio is also named for George E. Sebring (1859–1927) and his family.It was chartered by the state of Florida in 1913, and was selected as the county seat of Highlands County when the county was created in 1921.